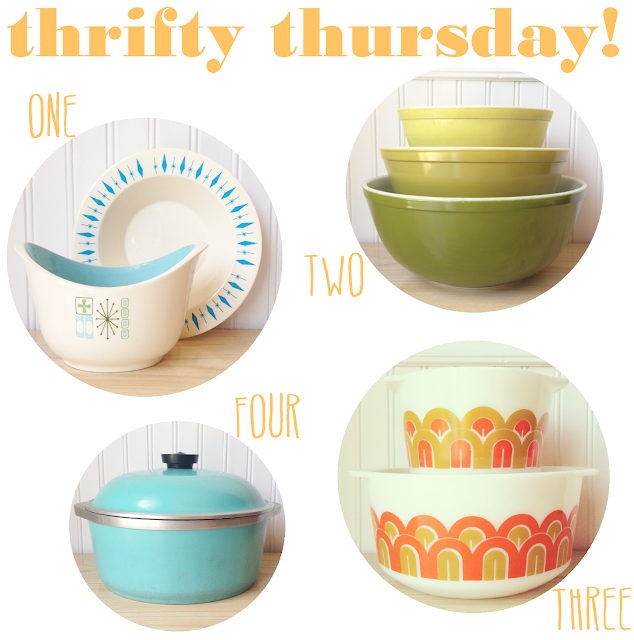 It's Thrifty Thursday! It's been too long since I posted some of my lovely thrifted treasures with you all so I decided today was the day! I've been mostly thrifting for Pyrex, but in the last week or so I've found some great vintage housewares to add to my collection. 1.// While at the flea market I picked up these amazing diamond and star burst print bowls for a steal, they were a dollar a piece so I grabbed a few. I also stumbled upon this awesome atomic print planter, it was .50 cents and it looks so cute in my kitchen window! 2.// This Verde set is missing the 401, if you have one and want to get rid of it let me know! I found the set while at the thrift store across the street from my house for $10.00! What?! 3.// I've had my 343 Arches for some time now, so I was absolutely thrilled when my mom pulled the 344 out of my step-father's dad's house. It's perfectly minty and they display beautifully together! 4.// This turquoise enamel Club pot looks absolutely wonderful in my kitchen and was also a find from my mom, free stuff is the best stuff! What have you been thrifting for lately? Do you have a goal when you thrift or do you pick up whatever catches your eye? Oooh, love The Verde Bowls. You should come thrifting in Chicago sometime! I love it all! I'm terrible at thrifting, I never find anything lovely. Wow! Great deals! I wish that there were more thrift shops in England.